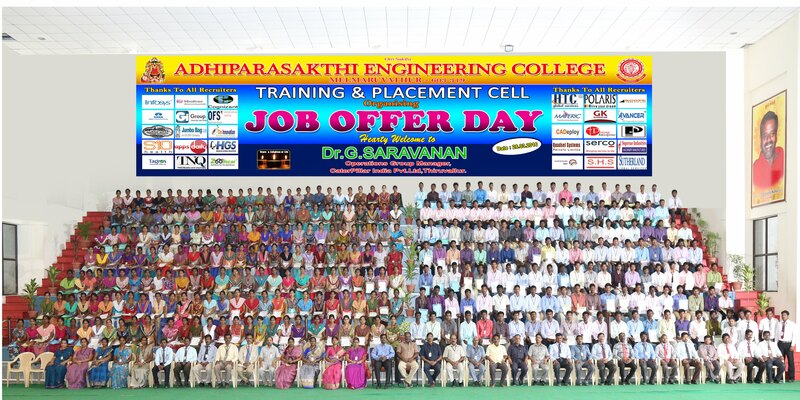 The Training & Placement Cell, Adhiparasakthi Engineering College facilitates the process of placement of students passing out from the Institute besides collaborating with leading organizations and institutes in setting up of intern-ship and training program of students. The goal of Training & Placement Cell is to Provide employment opportunities and world class training to the students in Leading Organizations. The T & P Cell is well equipped with ample infrastructure in Terms of Training Hall, Dedicated Auditorium, Testing halls, Consultancy Hall for Pre Placement Talk,Presentations etc. Tagros Chemicals Pvt Ltd campus interview on 20/3/19 for CHEM students Tagros Chemicals Pvt Ltd campus interview on 20/3/19 for CHEM students @ A-4/1, National Highway 45A, Pachchyankuppam, Tamil Nadu 607003. TSMT Technology campus interview for ECE/EEE Students on 16/3/19 TSMT Technology campus interview for ECE/EEE Students on 16/3/19 @ Anand Institute of Higher Technology, OMR Road, Kazhipattur, Chennai. Jasmin Infotech Pvt Ltd ON campus interview on 15/3/19 for ECE students Jasmin Infotech Pvt Ltd ON campus interview on 15/3/19 for ECE students @ MCA Lab.